您可以上傳您的相冊到互聯網上的任何地方：到您自己的網站或博客。您甚至可以直接從您的硬盤共享一個專輯。如果您不擁有網站，請使用 jalbum.net＆ndash; 我們的社區網站 - ndash; 專門用於存儲，共享和展示專輯. 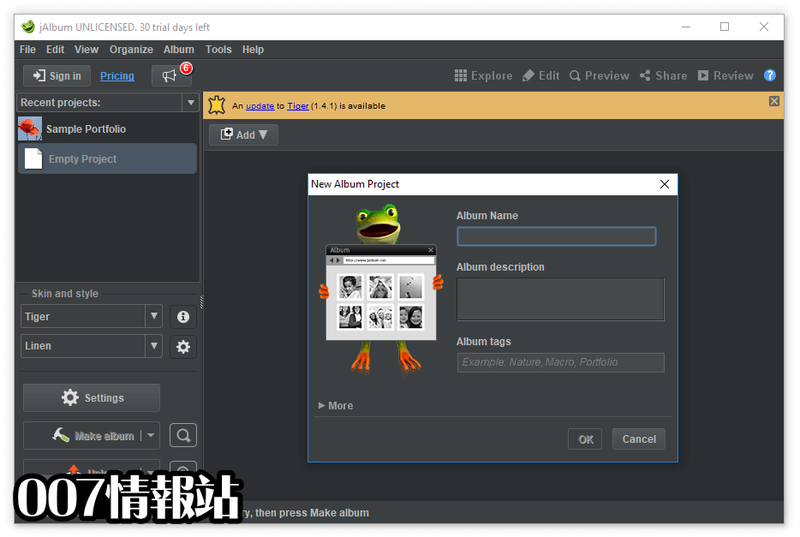 jAlbum 優化處理巨大的圖像量，並可以使用您當前的文件夾結構。這意味著您可以立即用更多圖片或新功能更新您的網絡相冊。一個普通的 jAlbum 畫廊有 70 個圖像，並且在一個有組織的網站上只有幾個點擊就可以找到有 10.000 到 100.000 個圖像的畫廊. 使用 jAlbum，銷售圖像（或其顯示的項目）真的很容易。只需要幾分鐘就可以設置一張配有購物車的相冊（僅由某些皮膚支持）。您決定要銷售的定價和產品。 jAlbum 目前與 PayPal，Google Checkout 和 Fotomoto 集成（也可以為您處理打印和發送）. - Defaults can now be stored and applied on a per-skin basis. See "File->Save as Skin Default"
- Cut+Paste support added. This mimics the Cut+Paste behavior in Windows Explorer and facilitates moving album objects around. Just select some album objects to move, hit CMD/CTRL+X, go to the destination folder and location and hit CMD/CTRL+V to paste the objects. The objects will be pasted close to the mouse pointer location. This feature will probably be appreciated by those who organize huge albums and feel uneasy with dragging and dropping and the scrolling it usually involves. - Now offering four new extra high quality image scaling algorithms: "Blackman-Bessel", "Blackman-Sinc", "Lanczos" and "Mitchell". jAlbum's image scaling should now match the best alternatives in the industry. See Settings->Images. Credit to TwelveMonkeys for these. 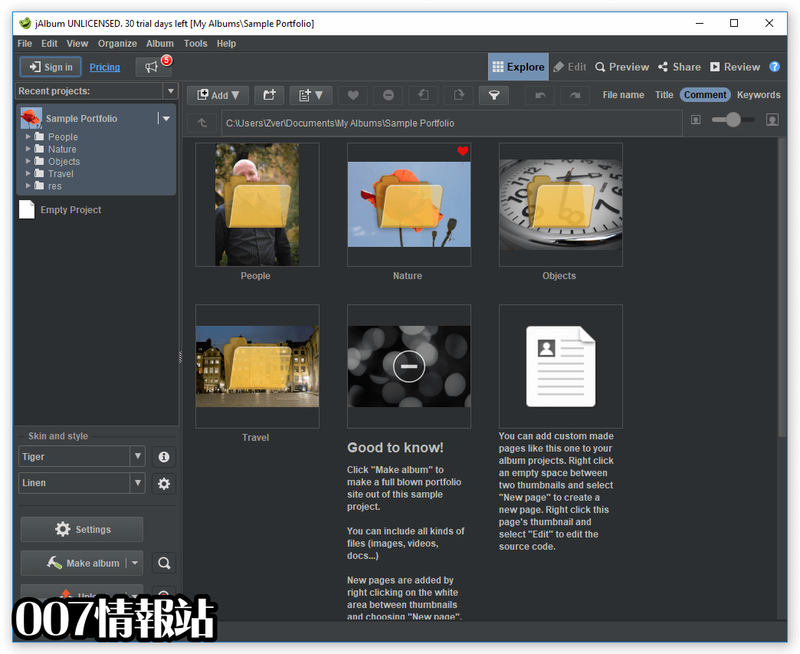 - New folder property panel allowing quick and intuitive selection of folder specific titles, descriptions thumbnail images and theme images as well as allowing easy selection of theme image crop focus. - Easier to use backups: Now generates "lifeboat" file to album folder during Make album instead of during publishing (toggle under Preferences->Album). 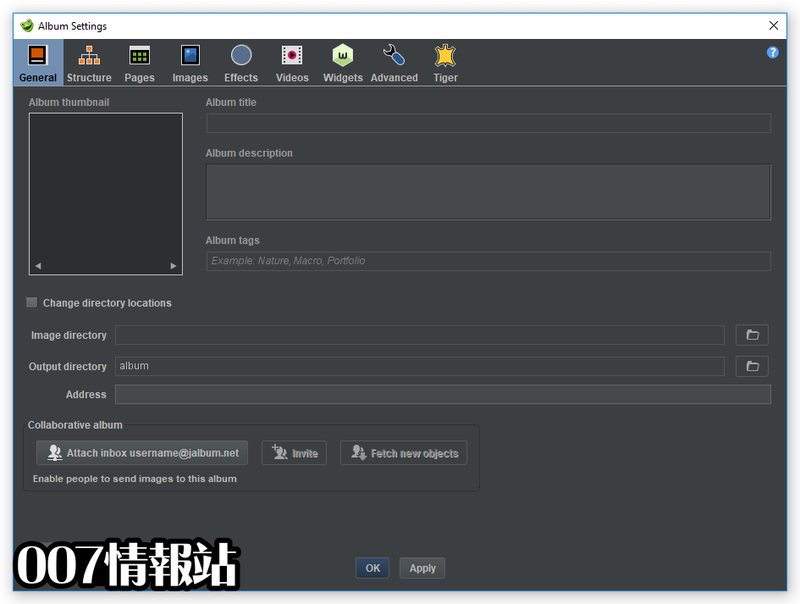 This enables users to retrieve backups from published albums even if they were uploaded with 3:rd party ftp tools. - Updated languages. Thank you dear translators. Missing your language? Contact us! - Developers. New APIs for adding theme images to your skins. - Fixed user interface scaling issue for hidpi screens causing too small user interface controls (Windows). 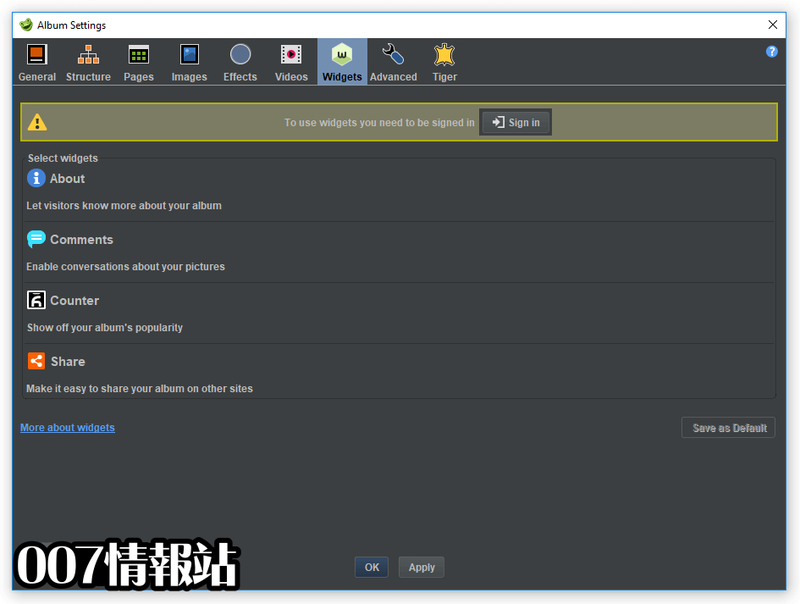 - Robustness improvements to database import tool. 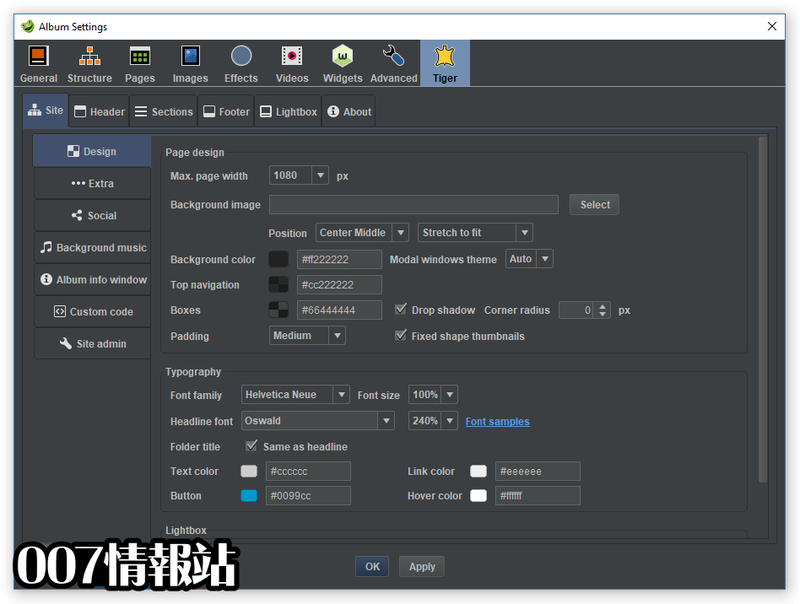 - Developers: New JFormattedComboBox component that allows presentation of combo box data in various formatted ways, for instance percentage format. - New album object type: "Web locations". Web locations are objects that can refer to any web page, not just local ones. This opens for some really interesting new applications for jAlbum. See for example this album collecting popular TED talks on YouTube. To add a "Web location" to your album, drop the web page onto jAlbum or select New page->Web location. Why not use this feature to make a master album out of existing albums? - Bundled skins "Minimal", "Base", "PhotoBlogger", "Turtle" and the new "Tiger" skin now supports Web Locations. - Developers: New "category" attribute for ja:if element, simplifying testing on categories, for instance: . Please replace with for better future compatibility. - Translations for major languages updated. Thank you dear translators!